Out of this World: New Mexico's Contributions to Space Travel describes how researchers in New Mexico found answers to major potential impediments to manned spaceflight--obstacles such as cosmic radiation, acceleration and deceleration forces on the human body, prolonged weightlessness, isolation and confinement in a space capsule, and methods for selecting and training astronauts. The book tells the human (and animal) stories of eighty years of adventurous experiments that helped make space travel possible. Chapter One: Goddard's Rockets:Space travel has its roots in the liquid-fuel rocket research and experimentation Robert Goddard conducted in Roswell beginning in 1930. The chapter introduces Goddard, explains why he came to New Mexico, and describes the rocketry innovations he developed here. Chapter Two: Operation Paperclip and Beyond: In the midst of World War II, the White Sands Proving Ground was established to support the Manhattan Project. Immediately following the war, a group of German scientists and engineers, including Wernher von Braun, were brought there to teach Americans about the Nazi's remarkable V-2 missiles and help them develop even better rockets. The chapter introduces von Braun and describes the rocket experiments conducted at White Sands. Chapter Three: Animals Aloft: Attempts to send animals into space began in 1947, when a V-2 rocket carried fruit flies aloft from White Sands. Starting from this humble beginning, the chapter describes the increased sophistication of the animal-in-space program, starring monkeys and chimpanzees housed and trained at Holloman Air Force Base near Alamogordo. Chapter Four: Silent Skyhooks: Before attempting to send humans into space, the federal government conducted various tests to prove men could physically endure such a journey. The White Sands Missile Range and Holloman Air Force Base contributed significantly to evaluating the threat of cosmic radiation, and designing and testing space capsules and escape systems. Of particular importance were a series of tests, including the Manhigh and Excelsior projects, that used helium balloons to carry men to extremely high altitudes. Chapter Five: The Human Factor: New Mexico played a key role in preparing to send people into space. Experiments at Holloman Air Force Base provided invaluable information on the limits of human tolerance of the severe forces astronauts would endure during takeoff and re-entry, and human tolerance for weightlessness. The Lovelace Clinic in Albuquerque developed and conducted the physical examinations for selecting NASA's first astronauts. Chapter Six: Window on the Universe: Astronomical observations began in New Mexico more than a thousand years ago. The chapter first examines several ancient observatories. Then it describes various types of astronomical studies conducted or based in New Mexico from 1953 to the present. The discussion includes optical observatories such as the National Solar Observatory at Sacramento Peak and radio telescopes such as the Very Large Array. Chapter Seven: Alien Visitors: A discussion of space travel and New Mexico would be incomplete without acknowledging the Roswell Incident of 1947. The chapter presents an even-handed discussion, including pieces of evidence that support and debunk the alleged events. It also describes other potentially extraterrestrial phenomena such as cattle mutilations, the alleged underground alien base near Dulce, and the Church of Scientology's enigmatic landscape markings in northern New Mexico. Chapter Eight: Xpediting Commercialization: A commercial space launch site began to take shape in New Mexico in the early 1990s when the grass-roots Southwest Spaceport Task Force was organized. The chapter chronicles events that moved that fanciful notion toward reality, including the X Prize Cup and Lunar Lander Challenge competitions held in New Mexico in the 2000s. Chapter Nine: Spaceport America: Construction is under way on the world's first purpose-built commercial space facility, Spaceport America, in southern New Mexico. The chapter describes the activities already being conducted at the spaceport, including launches by UP Aerospace. It also examines the eminently practical and aesthetically stunning architecture of the earth-integrated terminal and hanger building currently being built. Finally, it explores the notion of space tourism and describes the program being developed by Virgin Galactic, Spaceport America's anchor tenant. Chapter 1, Goddard's Rockets: Space travel has its roots in the liquid-fuel rocket research and experimentation Robert Goddard conducted in Roswell beginning in 1930. The chapter introduces Goddard, explains why he came to New Mexico, and describes the rocketry innovations he developed here. Chapter 2, Operation Paperclip and Beyond: In the midst of World War II, the White Sands Proving Ground was established to support the Manhattan Project. Immediately following the war, a group of German scientists and engineers, including Wernher von Braun, were brought there to teach Americans about the Nazi's remarkable V-2 missiles and help them develop even better rockets. The chapter introduces von Braun and describes the rocket experiments conducted at White Sands. Chapter 3, Animals Aloft: Attempts to send animals into space began in 1947, when a V-2 rocket carried fruit flies aloft from White Sands. Starting from this humble beginning, the chapter describes the increased sophistication of the animal-in-space program, starring monkeys and chimpanzees housed and trained at Holloman Air Force Base near Alamogordo. Chapter 4, Silent Skyhooks: Before attempting to send humans into space, the federal government conducted various tests to prove men could physically endure such a journey. The White Sands Missile Range and Holloman Air Force Base contributed significantly to evaluating the threat of cosmic radiation, and designing and testing space capsules and escape systems. Of particular importance were a series of tests, including the Manhigh and Excelsior projects, that used helium balloons to carry men to extremely high altitudes. Chapter 5, The Human Factor: New Mexico played a key role in preparing to send people into space. Experiments at Holloman Air Force Base provided invaluable information on the limits of human tolerance of the severe forces astronauts would endure during takeoff and re-entry, and human tolerance for weightlessness. The Lovelace Clinic in Albuquerque developed and conducted the physical examinations for selecting NASA's first astronauts. Chapter 6, Window on the Universe: Astronomical observations began in New Mexico more than a thousand years ago. The chapter first examines several ancient observatories. Then it describes various types of astronomical studies conducted or based in New Mexico from 1953 to the present. The discussion includes optical observatories such as the National Solar Observatory at Sacramento Peak and radio telescopes such as the Very Large Array. Chapter 7, Alien Visitors: A discussion of space travel and New Mexico would be incomplete without acknowledging the Roswell Incident of 1947. The chapter presents an even-handed discussion, including pieces of evidence that support and debunk the alleged events. It also describes other potentially extraterrestrial phenomena such as cattle mutilations, the alleged underground alien base near Dulce, and the Church of Scientology's enigmatic landscape markings in northern New Mexico. 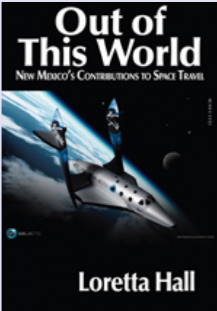 Chapter 8, Xpediting Commercialization: A commercial space launch site began to take shape in New Mexico in the early 1990s when the grass-roots Southwest Spaceport Task Force was organized. The chapter chronicles events that moved that fanciful notion toward reality, including the X Prize Cup and Lunar Lander Challenge competitions held in New Mexico in the 2000s. Chapter 9, Spaceport America: Construction is under way on the world's first purpose-built commercial space facility, Spaceport America, in southern New Mexico. The chapter describes the activities already being conducted at the spaceport, including launches by UP Aerospace. It also examines the eminently practical and aesthetically stunning architecture of the earth-integrated terminal and hanger building currently being built. Finally, it explores the notion of space tourism and describes the program being developed by Virgin Galactic, Spaceport America's anchor tenant. Unless otherwise credited, all material on this site is © Loretta Hall 2010-2017.